Greetings friends and fellow crafters, LeeAnn here with Creative Vision Stamps sharing a project I had fun making. Using the Creativity Foilable Pack and Queen's Crown Foil I started in on the fun. I warmed up my Scotch laminator and prepped my project. 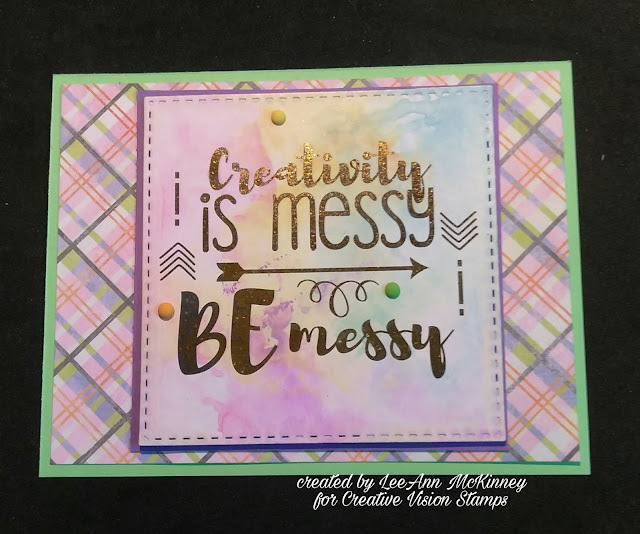 I cut the panel I want to use from the Creativity pack using a stitched square die. Once the laminator was hot, I put the panel and a cut from the Queens Crown Foil to a sheet of copy paper folded in half. I ran this through my laminator twice. Once this was complete and cooled off, I removed the foil. And went to work on the really fun part. I used Distress Oxides in Picked Raspberry, Fossilized Amber, and Broken China smooshed them on a craft mat, spritzed with water and ran my foiled panel through it, I then smooshed it around a bit to get he colors to move. I tapped off with a paper towel and was very pleased with the blending that took place. I cut from purple cardsock a panel slightly larger than the foiled panel, and used fun foam to adhere the foil panel. I then went through my stash and found a plaid paper with the same colors, adhered that to a mint green cardstock and the purple panel to the plaid using double stick tape. I added 3 enamel dots in Lime, Orange and Lemon and my project was complete.